If you think smartphone designs are getting a little stale, you may want to hold out for the next export from Russia-based Yota Devices. 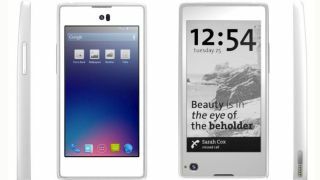 Thanks in part to a licensing deal with Qualcomm, the company's two-sided Yota Phones, which combine e-ink and LCD displays, could soon hit the global market. Yota Devices announced at Mobile World Congress on Wednesday that a new software licensing agreement with Qualcomm will bring LTE smartphones, modems and routers to market in Russia. As TechCrunch pointed out, the deal will also help Yota compete on a global scale. This is Qualcomm's first software licensing deal in Russia, a market that it sees as "strategically important," according to Qualcomm Europe President and Senior Vice President of Qualcomm Technologies, Inc., Enrico Salvatori. "We expect strong growth in the number of 3G smartphones [in Russia] over the next two years," he said. But for Yota Devices, the Qualcomm deal means an easier way into the global market. Yota has made its bread and butter up to now with modems and routers within Russia - the Android Jelly Bean-powered Yota Phone being its first foray into smartphones. According to TechCrunch, the Yota Phone will debut in Russia during the second half of 2013, with an Asian release to follow. If the two-faced phone catches on, the company will undoubtedly look to a worldwide release, and with Qualcomm's weight behind it, that transition could be easier than some might expect. That is, of course, if people want to buy a two-faced phone. The Yota Phone certainly has strange powers. There's a 4.3-inch, 1280 x 720 LCD display on the phone's face, while the back features a 4.3-inch e-ink electronic paper display. The e-ink side can be used to see notifications, check the time, answer calls and more, while the LCD display only needs to be woken up for videos, web browsing, and other similar functions. Since the e-ink display uses just a trickle of battery power, the Yota Phone apparently can last a fair amount of time a single charge. Presumably, it will make a decent e-reader, too.